I have had the opportunity to do two of Caroline Price's classes. The first was at my first Quilting Retreat at Burrendong Dam. Throroughly enjoyable time stitching, eating, stitching, and more eating. No wonder I keep putting my hand up for these enjoyable type of retreats. At this retreat we were learning how to make a Double Wedding Ring. Arcs were pressed over freezer paper templates and then machine appliqued to squares with corner triangles, before the squares were joined together. I fussy cut my striped fabric. I then used T-shirt transfers to make the pictures to put on this quilt for my mum. I tried to get the wedding photos from all 6 of her children but we all didn't come to the party. So instead I raided the old photo albums for pictures of us in our youth, adulthood, the grandchildren and times when we have all got together. 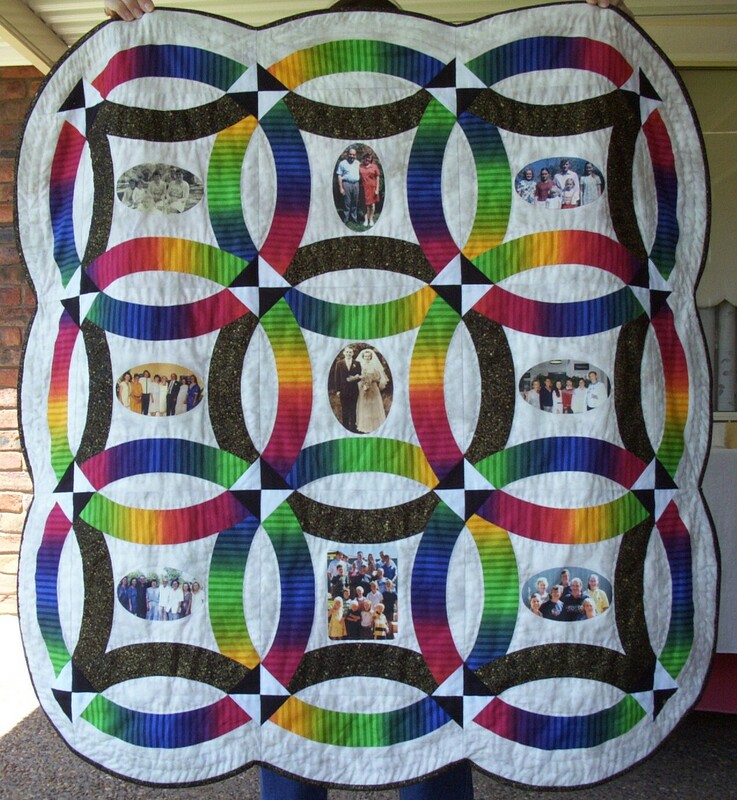 I then hand quilted it, but not over the photos. This quilt has not faired the washing as well as I had hoped but it is much loved. The second workshop I did with Caroline was a 2 day landscape workshop. When I showed my chosen photo, the comment was made it will turn out like a blob. I don't think it did! We had visited Uluru the month before the class, and it had been "raining on the rock - what a beautiful sight to see" so I tried to replicate the rain with the threads. There are over 20 different threads in this wall hanging giving it a real tapestry affect.